Red Bull Media House in association with Freeride Entertainment premiered a new motorcycle documentary On Any Sunday: The Next Chapter at the Dolby Theatre in Hollywood tonight. Over 400 motorcycle riders from Southern California cruised in and parked their bikes along Hollywood Blvd to celebrate Director Dana Brown's follow-up to the 1971 Academy Award®-nominated documentary, On Any Sunday, directed by his father, Bruce Brown, who also attended the premiere. Red Bull Media House in association with Freeride Entertainment is proud to announce the home entertainment release of the motorcycle documentary On Any Sunday: The Next Chapter . From director Dana Brown ("Step Into Liquid," "Dust to Glory"), the film is a follow-up to the 1971 Academy Award®-nominated documentary, On Any Sunday, directed by his father, Bruce Brown. After making its world premiere at the 2014 San Sebastian International Film Festival, On Any Sunday: The Next Chapter was released theatrically on November 7, 2014. The film has amassed over $500,000 at the box office to date, making it the highest grossing sports documentary of the year. Starting today, audiences can pre-order the 3-in-1 Collector's Edition, which includes DVD, Blu-Ray™ and digital download copy, exclusively at the Red Bull Shop prior to its release on February 17, 2015. The film is also currently available for digital pre-order on iTunes. Every iTunes purchase comes jam-packed with the most iTunes Extras bonus features of any other action sports film. Extras include "Kurt Caselli Bike Build", "The Future of Two Wheels", "Impact of the Original 'On Any Sunday' Film", "The Legacy of Motorcycles" and "Skullcandy's Robbie Maddison Drop In". 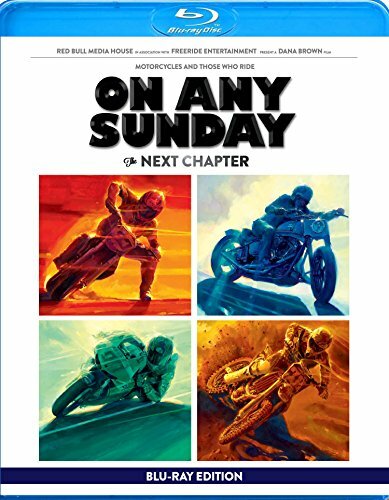 On Any Sunday: The Next Chapter will be available on DVD and Blu-Ray™ at Best Buy, Target and Wal-Mart stores, as well as On Demand beginning February 17, 2015. DVD and Blu-Ray™ special features include "The Brown Legacy", "KTM / Caselli Bike Build", "Riders for Health" segment, "Skullcandy¹s Robbie Maddison Drop In clip", Teaser and Trailer. The Blu-ray™ is encoded in Dolby TrueHD and features a Dolby Atmos® soundtrack remixed specifically for the home theater environment. Dolby Atmos* delivers captivating sound that places and moves audio anywhere in the room, including overhead, to bring entertainment alive all around the audience. When On Any Sunday premiered in 1971, it wasn't just any movie. Directed by Bruce Brown – who also helmed surfing classic "The Endless Summer" – this insider look at motorcycle culture reached a wide audience that was fascinated by the heartfelt stories of the men behind the bikes, earning an Academy Award®-nomination for Best Documentary Feature. Four decades later, On Any Sunday: The Next Chapter shows that the passion for riding motorcycles is as strong as ever. Dana Brown directs this modern take on the original, capturing what it means to ride in the United States and abroad. The first feature film from Red Bull Media House shot entirely in 4K Ultra HD, the action and emotion are breathtaking: phenomenal athletes, revolutionary innovators, Hollywood stars and even visionaries who use motorcycles to save lives. On Any Sunday: The Next Chapter is an exploration into the pursuit of excitement, passion and life in the world of motorcycle riding. The 90-minute documentary film features today's powered two-wheel superstars including MotoGP riders Marc Márquez and Dani Pedrosa, action sports superstar Travis Pastrana, freestyle motocross pioneer Robbie Maddison, Pikes Peak International Hill Climb motorcycle champ Carlin Dunne, women's motocross champ Ashley Fiolek, motocross legend Doug Henry, custom motorcycle designer and former racer Roland Sands and one of the most successful riders in supercross history, James Stewart. Over the past fifteen years, Freeride Entertainment has produced award-winning content in over forty countries. Born from the lifestyle of adventure sports and "high end" action filmmaking, Freeride Entertainment offers full creative and production services all under one roof. Working with a diverse group of producers, directors, cinematographers, post specialists and special effects artists; Freeride's world-class production team has brought images to life from the jungles of the Amazon to the mountains of Morocco. With state of the art production equipment and post-production facilities, Freeride continues to push the boundaries of film, television, web and commercial properties.